Hallwalls' archive is housed at the Poetry Collection of the University at Buffalo Libraries. The special collection includes documents from the first 30 years of Hallwalls activities, such as administrative and curatorial records, artist files, calendars, catalogs and publications, slides, photographs, broadsides, posters, and ephemera. Since 2004, the Poetry Collection has served as the repository for Hallwalls' Video Collection. Thanks to the dedicated effort by archivists and students at the Poetry Collection, our archives are now accessible via UB's libraries. Please visit the Poetry Collection to learn more about our collection and its other unique holdings. Since our founding, numerous national and international artists have visited Hallwalls for performances, screenings, readings, panel discussions, and exhibitions. As early as 1977, Hallwalls received support from the New York State Council on the Arts to document its multi-disciplinary activities using video. Over the years, we have amassed a collection that serves as a recorded history of contemporary art practices in the fields of performance, music, literature, visual and media arts. In the 1990s, Hallwalls also played a role in the community as a Media Arts center, providing a post-production facility that was used by local artists and activists. Our collection also includes works produced by national and international artists through Hallwalls residency programs. In 2003, under the leadership of then Media Arts Director Joanna Raczynska, Hallwalls began to catalog and assess its video collection, work supported by Technical Assistance from the Experimental Television Center; Hallwalls utilized a customized template designed by IMAP (Independent Media Arts Preservation) for the cataloging project. Upon leaving the Tri-Main Center in 2004, Hallwalls moved its video collection to the University at Buffalo's Poetry Collection, where the controlled environment provided a stable home for these fragile tapes. 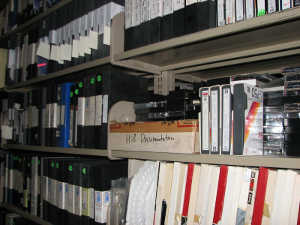 With support from the National Endowment for the Arts Heritage and Preservation Program, as well as a grant from the National Television and Video Preservation Foundation, Hallwalls was able to initiate the preservation of a number of tapes that are now available to scholars and researchers at UB's Poetry Collection. Many of these tapes were preserved through the Standby Program (NYC), and include documentation of performances by Laurie Anderson, Ethyl Eichelberger, Karen Finley, Mike Kelley, Pat Oleszko, Michael Smith, Tony Conrad, Joe Gibbons, David Wojnarowicz, and Nick Zedd among many others. In April 2009, Hallwalls—in collaboration with Squeaky Wheel and the Experimental Television Center—launched a new partnership program, Migrating Media: Upstate Preservation Network. The new project, made possible by a generous donation of a SAMMA Solo by Jim Lindner, offers arts and cultural organizations a new model to migrate analog videos to digital, assuring access and preservation for future generations. Today, the project's partners include the Burchfield Penney Art Center, as we break ground on a virtual workspace. 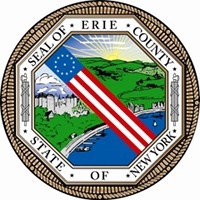 The Migrating Media project has been made possible by funding from the Electronic Media & Film program of the New York State Council on the Arts and the Media Arts program of the National Endowment for the Arts. The Hallwalls Digital Archives Project was made possible by a generous Digitization grant from the New York State Council on the Arts, with additional support from the National Endowment for the Arts. In January 2007 Hallwalls began a digital history project aimed at providing visitors to our website with: 1. an archive of digitized materials and 2. a searchable timeline spanning 35 years of events and programs. Supported by a special Digitization grant from the New York State Council on the Arts, this major initiative will provide artists and curators, scholars and students, with a tool that directly connects them to our history. The digital timeline is a searchable database covering thousands of events that have taken place at Hallwalls, as well as those outside activities that we have co-presented. Searchable by year, category, and keyword, the timeline is also designed to seamlessly merge with our current activities, thus providing a flow from the past to future Hallwalls events. In addition, newly digitized materials—from images to texts—will offer complementary resources and documentation of the activities from our past. Cally Alessi, Hannya Boulos, Ariel Brickman, Justin Chartrand, Amanda Chase, Katie Coyle, Beth Day, Amanda DeBoer, Amanda Dunker, Scott Jarrett, Linda Jules, Tracy Gladkowski, Rachel Good, Lynn Lasota, Lin Shu-Wen, Corey Mansfield, Lisa Muscato, Ayondela Noble, Rachel Patall-David, Shannon Schiedel, Ben Siegel, Talia Silveri, Cayla Sweeney, Hodari Vassell, Mariel Volk, Chris Williams, Charlotte Zoda. While we've made every effort to edit the timeline and have cross-referenced our content several times, there are undoubtedly errors. So please, if you see something, say something! We will rely on visitors to the site to help us to not only catch mistakes, but also to fill in the gaps. If you are an artist with more information, if you were in attendance at an event and have documentation that you would like to share with our archives, we invite you to contact us. Just as our events continue, this Hallwalls history project is a work in progress. We look forward to hearing from you! The Hallwalls Digital Archives Project was made possible by a generous Digitization grant from the New York State Council on the Arts. Program 14: IN SOLIDARITY PARTS 3 AND 4 (Bogdan Sulik, video, 120 min) Second half of BBC documentary.